How to start your own design practice? According to estimates from the Bureau of Labor Statistics, there are 259,500 graphic designers in the U.S. and 24% of them are self-employed. 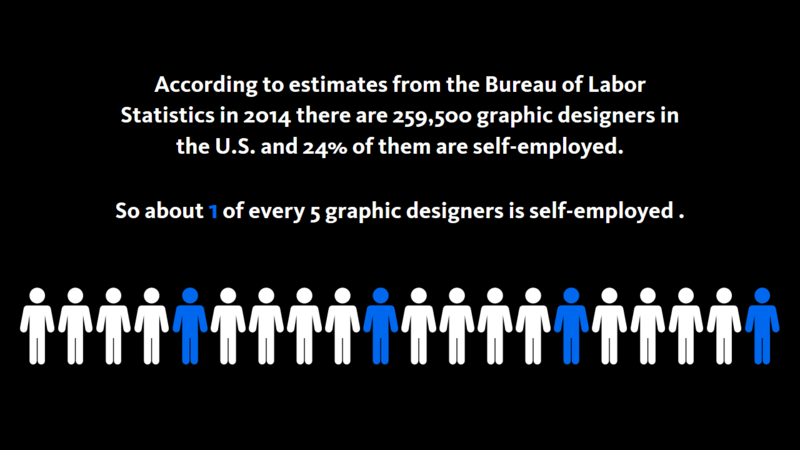 That means that approximately one out of five graphic designers is self-employed. Even thought so many of us eventually end up working for ourselves, graphic design programs in colleges do not focus enough (if any) on the business aspect of running a successful graphic design practice so young designers are going into business unprepared and uneducated about business issues. In the following article, you will find step by step guidelines on how to start your own design agency, drawn from my experience of running a small design agency for over a decade. This guide was written as a support material for my presentation at the 2016 National Student Show on April 8,2016, mainly to share some of the resources that I have found helpful. Enjoy! First, you have to ask yourself the question: Why do you want to start your own business? Is earning more money, flexibility or more creativity the reason? Sure there are lots of perks but we also have to consider the con: are you ready to quit a 40 hour work day only to find yourself working 60+ hours and not always get paid. There are lots of things you would have to give up – financial stability, comfort, nights and weekends, hanging out with friends to name just a few, and in order to properly evaluate if this is the right path for you must figure out what are your personal goals. What industries do you know about? Review your answers. So how do you know if it is going to be worth it at the end? By figuring out what are your long term goals and what makes you happy you will understand what values are important to you as a person and aligning these values with your business objectives will ensure that you are following right path for you. This is a check list that will help you determine if you are ready to go out on your own or you need to maybe weight for a bit. Do you crave independence and lack routine? Are you outgoing enough to enjoy talking about your work and “selling” with your portfolio? Do you want to freelance for other firms or agencies? If not, do you have enough contacts that could support your business? Do you like to wear different hats? Do you have any capital to cover initial costs? Six-Week Start-Up: A step-by-step program for starting your business, making money, and achieving your goals! How are you going to sell to them? What is the story you are trying to tell? Per value – You might not want to bill hourly. You focus too much on the input side and are more likely to track everything in detail. Ideally bill per week, or per day if the project is smaller. A combination of both – I find this to be the best method. It allows me to list value pricing for the initial estimate and charge hourly for additional work. In conclusion don’t get discouraged by all the things you have to do. Also, dream big and don’t be afraid to make mistakes. Everyone does. Know that even though there are some set backs, the rewards of owning a business are far greater than the set backs. Good Luck!